The art of carpet weaving has existed in Iran since ancient times. Historical evidences show that the first carpets were made from bamboos and stalks of plants growing in marshlands of lower Transoxiana. The production of mat-like floor covering by interlacing bamboos and stalks was in fact the first step taken towards setting up carpet weaving industry. Although the first floor covering seemed suitable for people living in tents, they were not so comfortable as they should be and for this reason animal skins were later used as floor covering. and their occupation in cattle breeding gradually made it necessary for those people to spend their leisure time on producing cheap and durable floor covering, using twisted wool fibers. Considering the living conditions of people and the materials needed for production of carpets on the one hand and the fact that freezing temperature in the heights of Iranian plateau forced tribal people who were living in tents to protect themselves against cold on the other, lend proof to the idea that Iranian plateau must have been the birthplace of carpet weaving and the taste of those simple people were effective in creating superb carpet designs and colors which were later brought to cities by nomadic tribes during a long period of time. 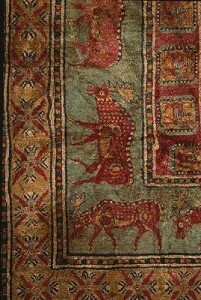 Before the Pazyryk rug was found, most archaeologists had been of the belief that the carpet with pile, as is common in today’s world, had come into existence in Iran one thousand years ago and that it had no precedence elsewhere in the world. However, the discovery of Pazyryk rug from the tomb of Pazyryk ruler in southern Siberia, caused the historians to change their previous theory and announce that weaving of piled carpets dated back to 500 BCE. 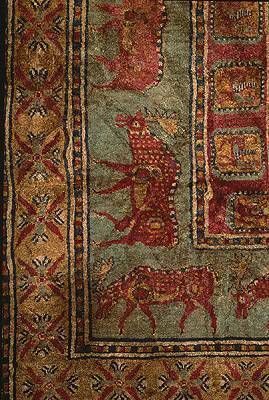 This 283 cm by 200 cm rug along with some other historical relics were unearthed during excavations by a Russian team of archaeologists in cooperation with Hermitage Museum at Pazyryk valley, 79 km from the border of Mongolia which used to be a part of Chinese territory in the past. There are 3,600 knots in each square decimeter of this rug. For several consecutive centuries the art of carpet weaving made progress to an extent that the famous Arch Palace of Sassanid King, Khosrow Parviz in Ctesiphone was covered by a carpet woven of golden threats which was known as `Four Seasons of Baharestan’. According to historians, the famous Taqdis throne was covered with 30 special carpets representing 30 days of a month and four other carpets representing the four seasons of a year. The fifth Omayyad caliph Hesham ibn Abd al-Malek (120 lunar hejira) had a 90 by 32 meter carpet made of silk and gold threads which could rank with the Baharestan carpet. There also used to be another superb Iranian-made carpet dubbed as `Bahar of Khosrow’ (spring of Khosrow), at the Palace of Ctesiphone which is referred to in Persian scripts as the `Arch Palace of Ctesiphone’. The carpet was 450 feet long and 90 feet wide, made for Sassanid king Khosrow and for this reason it was named `Bahar of Khosrow’. In the 8th century A.D. Azarbaijan Province was among the largest centers of carpet and rough Rug (ziloo) weaving in the country. 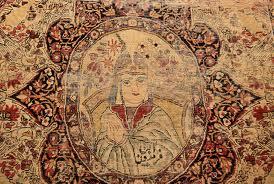 The Province of Tabarestan, besides paying taxes, sent 600 carpets to the courts of caliphs in Baghdad every year. At that time, the main items exported from that region were carpets, rugs and small rugs for saying prayers. Furthermore, the carpets of Khorassan, Sistan and Bokhara, because of their prominent designs and motifs were on high demands among purchasers. During the reigns of the Siljuk and Il-Khanid dynasties, carpet weaving was still a booming business so much so that a mosque built by Ghazan Khan in Tabriz, northwestern Iran, was covered with superb Persian carpets. Carpet designs depicted by miniature paintings belonging to the Timurid era lend proof to the development of this industry at that time. 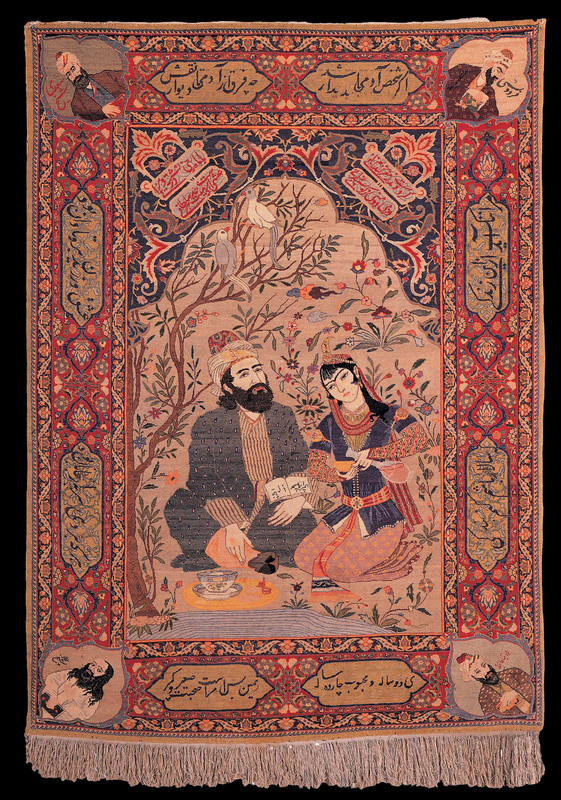 There is also another miniature painting of that time available which depicts the process of carpet weaving. During that era dyeing centers were set up next to carpet weaving looms. The industry began to thrive until the attack on Iran by the Mongol army. The attacks of the Mongol army and then of Timur the Lane on Iran brought a halt for some time to all artistic and industrial activities such as carpet weaving and dyeing in the country. Various books on the history of that time indicate that the subtlety and delicacy seen in the art of carpet weaving in later eras did not exist at that time. Geometrical designs consisted of direct or broken lines without any curves and therefore we cannot say that circular and floral designs or plant-shaped motifs had been imported to Iran after the Mongol attack on the country. Unfortunately, there are no more evidences available of the pre-Mongol eras in the country. During the last years of the reigns of the Timurid and Il-Khanid dynasties, carpet weaving regained its past glory but only a few rugs, silk cloths and some superb samples of fabrics knitted at the time of the Siljuk and Sassanid dynasties have remained from that era. 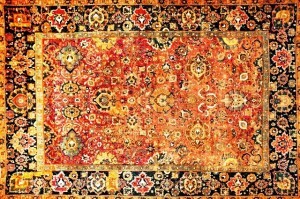 In these samples, the designs of carpets are more like those of Turkmen rugs with direct ad broken lines, made of wool. Some carpets and rugs woven at the early years of the Safavid period have been made of gold and silver threads, with the color of the margins being in contrast with the that of the central parts. In many carpets with medallion motifs, pictures of animals have also been woven. These designs have become known as animal designs. These carpets usually bear the pictures of plants and flowers among which pictures of various animals, either in group or at war, can also be seen. Some fabulous animals like dragon or birds like phoenix inspired by Chinese sources are among these animal designs. 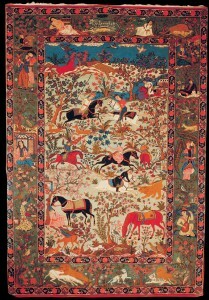 One of the famous carpets with animal designs, which is now kept at the Metropolitan Museum of New York, had covered the tomb of Sheikh Safi ad-Din Ardabili. Silk rugs, too, belong to the Safavid era. The carpets belong to that era are characterized by Eslimi designs which resemble strips with varying width. 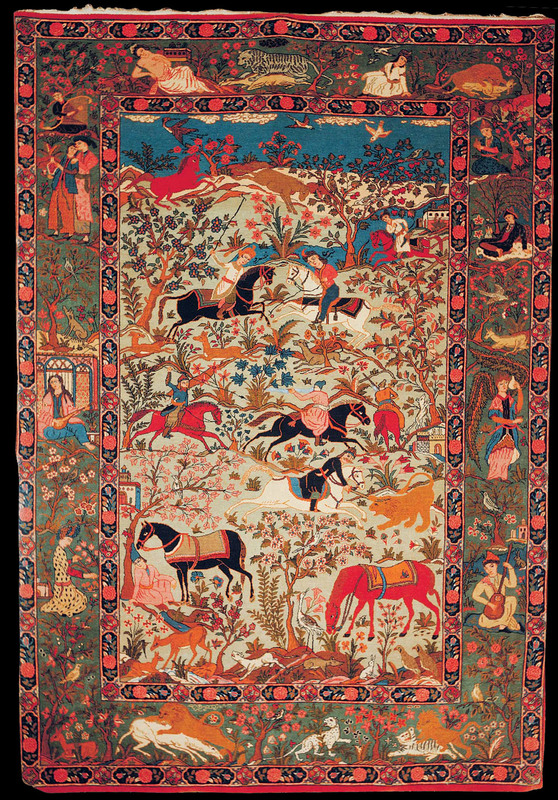 From the beginning of the Safavid dynasty to the end of the reign of King Abbas the First, carpets with images of animals, flowers and curled hair were designed. With the passage of time the design of Shah Abbasi flower (named after Shah Abbas) became bigger and bigger. 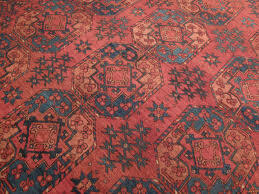 It is to be noted that the carpets woven in Harat greatly influenced the designs of Indian rugs. During the Safavid era, silk rugs with gold and silver threads bearing designs of dark colored flowers and leaves, were sent as presents to some European monarches. Some of these rugs found in Poland were referred to as Polish rugs until it became known recently that they had been made in Iran when compared with their similar rugs. 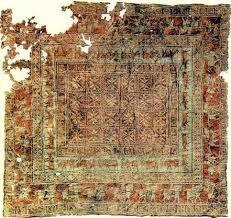 Some rugs woven like klims with gold and silver threads have remained from that era. Carpet weaving enjoyed great importance at the time of the Qajar dynasty. During this period, Arak and its suburbs in Central Province were the largest carpet weaving center. Production of carpet was common in the town of Soltanabad and its nearby villages. The carpets woven in this region have been divided into four categories by carpet traders. The best of these carpets was called Sarouq. The second degree carpet was called Mahal and the third degree Moshirabad which was rough. The last kind of these carpets was known as Leilahan which had long pile and were mostly woven in small villages inhabited by Armenia people for purpose of trade. Azarbaijan This region has been famous for its carpet weaving industry for centuries. 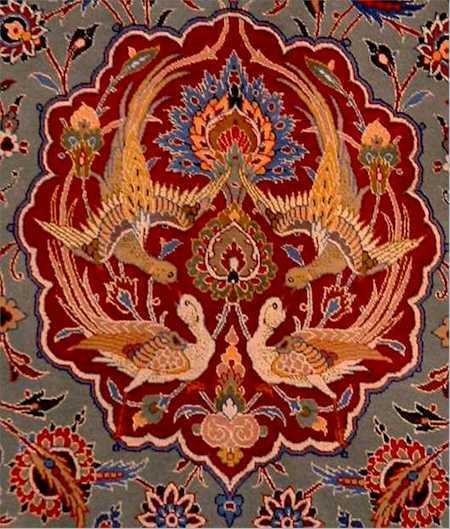 In Tabriz, the capital of Azarbaijan, carpets with various motifs and qualities are produced. There are carpets with varying qualities in Tabriz. The warp of all of them is made of cotton. 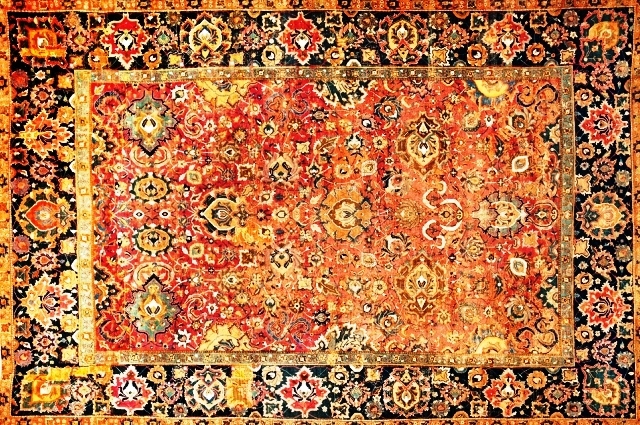 The old carpets of Tabriz are mostly red-colored with medallion motif. 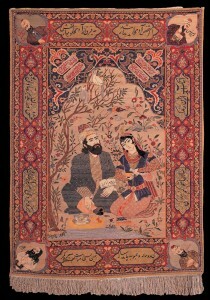 However, carpets produced in Tabriz have no exclusive designs. Silk carpets have long been woven in Tabriz but they are of the same quality as silk carpets woven in Kashan. Balouchi rugs are woven by nomadic tribesmen. Like Turkmen rugs, these carpets have dark red-colored background but are woven more loosely than the former. There are various motifs on these rugs with dark blue and dark red colors being used in them. These rugs are ordinary and inexpensive. Farahan The carpets of Farahan have short pile and dark blue background. These carpets have two types of motifs. One is the picture of a large fish which look like intertwined leaves and the other is the picture of a greenhouse with bunches of flowers. Joshaqan: This kind of carpets was very famous during the era of the Qajar dynasty because of their special medallion and rectangular designs. 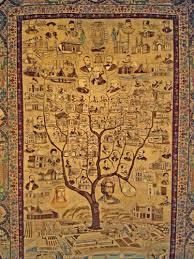 Guravan: The carpets of Guravan are produced in a village with the same name and other villages near Haris. The designs of these rugs are geometrical shapes just like Haris carpets. Hamedan: The older carpets of this region had their own features. The margins of these carpets were made of camel wool. These kinds of rugs are very scare nowadays. 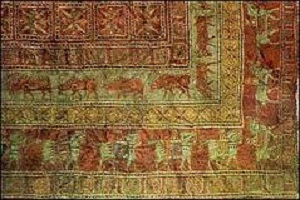 Other small rugs used to be woven in the region which were known as Musel. Haris: The carpets of Haris are among the best ones produced around Tabriz. These rugs are heavy and thick and are known for their durability. The color of their background is usually red or madder obtained from root of herbs grown in nearby regions. Herbal dyes are used in these carpets whose designs are mostly geometrical shapes. The designs sometimes include medallions. The carpet weavers in Haris do not have ready made designs but they weave carpets according to the designs they know by heart. Like other important carpet weaving regions, Haris has good water suitable for washing the wool. Isfahan: The carpets of Isfahan mostly bear the Shah Abbas designs consisting of medallions and Shah Abbasi flowers. Kashan The carpets woven in Kashan are among the best in Iran in terms of knitting. The designs of these carpets are quite visible. The carpets have short pile and usually a medallion design at the center and medallions at their four corners. They are made of silk and wool. Silk is provided from the northern Caspian regions and the wool used in some carpets is imported from England. Kerman The carpets of Kerman usually have light colored background. Their motifs include pictures of trees that are sometimes seen in a vase, flowers, and leaves. Some high quality rugs woven in Kerman bear pictures of animals. Such rugs are woven in various parts of Kerman Province such as Rafsanjan. Kordestan: In Garrus and Bijar, both in Kordestan province, special carpets are woven whose warp and weft are both made of wool. These rugs are so rigid that they may be torn apart when they are folded. The design of the carpets consists of a medallion at the center and corner medallions with the same shape. The background has a fish-shaped picture and other pictures whose colors are in contrast with the color of the medallion. Other coarse rugs with high pile are woven in the mountains of Kordestan and Kermanshah provinces. The nomadic tribes of Khorassan Province weave some carpets known as Turkman or Bokhara carpets. The background of these rugs is red in color and their designs are made up of a series of polygonal shapes which are called `Pafili’ designs. Some of these rugs have been divided into four categories which are referred to as `Four Season’ carpets. Mahallat: The carpets usually called Mahal do not have tightly woven knots but have orderly knitting. The motif of these rugs are generally flowers and leaves, with mostly dark colors being used in them. The color of the background is red and that of margins is dark blue. Malayer: In Malayer region, carpets are woven which are similar to the carpets of Hamedan and Arak. Darjazin village is known for the color of carpets woven there. The good color of these carpets is attributed to the good water used for washing the wool which helps reveal its color. 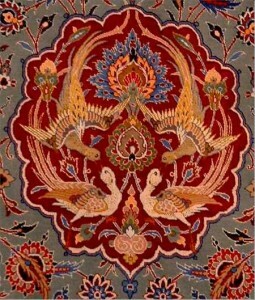 Qarajeh: The Qarajeh rug is woven in Qaredagh region, north of Tabriz. These rugs are small in size and used to cover the borders of rooms. The color of their backgrounds is red or dark blue and their design is a star-shaped or octagonal medallion. Sarab: The carpets of this region are usually called Sarabi. They are thick and their warps are knitted with sheep or camel wool. Octagonal medallion designs are repeatedly used at the center of these rugs. Narrow rectangular rugs woven in Ardabil, northwestern Iran, had different motifs and were known for their coloring. Their backgrounds were mostly light or dark brown in color. This type of rug is no longer knitted in the region. Small rugs were also woven in Zanjan during the Qajar period in which chemical dyes were used. These dyes were imported and their price was cheaper than the original herbal dyes made in Iran. The application of synthetic and chemical dyes which began in the Qajar period dealt a great blow to the fame of Persian carpets throughout the world. Sarband: The higher quality and older carpets woven in this region are called Mir. The background of the rug is filled with almond or pear-shaped designs and it has striped margins with pictures of curled hair. Sarough The carpets woven in this region in the past were considered as among the most durable rugs in the country. Its design include a medallion at the center, and an open background bearing a few pictures. Dark blue and red wools are mostly used in this type of carpets. 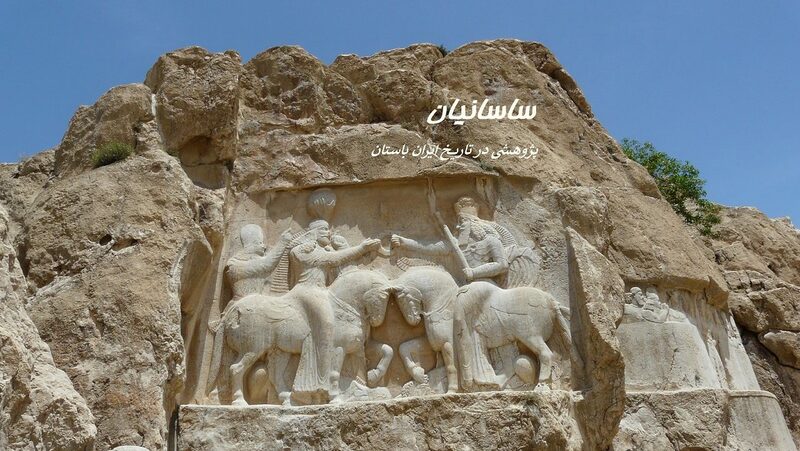 Seneh: The region which is now called Sanandaj is the center of best klims woven in Iran. Both sides of these klims are the same. The pictures of fish are used most often in these klims. Carpets and rugs are also woven in Sanandaj some of which are very subtle and superb with special knots. Shiraz: The carpets known as carpets of Shiraz are woven by Qashqa’ee tribes and other nomadic tribesmen living in tents. These rugs are loosely woven and are very smooth with motifs of octagonal medallions at their centers. In this type of carpets, dark blue and brown colors along with lighter colors are used.